The Dakar is one of the toughest motorsport events around, if not the toughest. It pits man and machine against the harsh desert and takes no prisoners. In recent years, Volkswagen have had a stranglehold on the car event and that grip didn’t yield this year either. Carlos Sainz, the legendary WRC competitor and former champion won the event last year in his Touareg and was back again this year determined to repeat this success. The event takes about 15 days to complete and as such it’s impossible to detail everything that went on. In the end, Volkswagen dominated once again ahead of BMW who had puncture problems which ultimately cost them a chance at a podium. 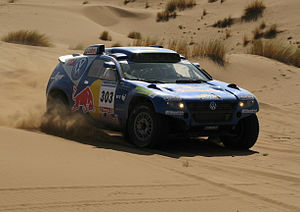 Nasser Al-Attiyah won the event ahead of Giniel De Villiers. Carlos Sainz was third after a front suspension failure in one of the final stages cost him over an hour and a chance at the title. With that said, Nasser drove an excellent rally, took chances which paid off, and even though he was lucky reliability wise, you have to be lucky in this kind of event as skill isn’t enough often times. Just ask BMW’s Stéphane Peterhansel who despite being incredibly successful in Dakar on both bikes and in cars, couldn’t overcome his car’s delicate tyres. In the bikes, Marc Coma and Cyril Despres were really the only two in the frame for the win, and it was Coma who emerged victorious. It was lucky that he won it by a margin of 15 minutes because had he finished less than 10 minutes ahead of Despres, then the Frenchman’s 10 minute penalty for waiting in a neutral zone would have come back to haunt both riders. It’s a great event and it was fantastic to see those two really nice and friendly competitors emerge victorious. The event is contested in a very sporting and respectful atmosphere. At one stage, Volkswagen’s fourth driver Mark Miller stopped to help Sainz fix his front suspension, if it wasn’t for the great help of his team-mate, Carlos would have lost a lot more than an hour and probably his podium finish as well. Unfortunately, I don’t know enough about Trucks or ATVs to comment but they take incredible skill to drive those vehicles in the terrain they were faced with, regardless of who won. I can’t wait to watch it again next year, and I can only hope that I get to drive one of those Red Bull Touaregs on Gran Turismo or some other game sometime as they look extremely fun to drive from what I’ve seen of them on TV.